In our commitment to provide you with a flawless skincare routine, we have reviewed 5 of the most in-demand toners specifically designed for sensitive skin. These toners were then assessed based on their ingredients, their gentleness on the skin, and their friendliness on the budget until we picked what we believe is the best toner for sensitive skin. A naturally-preserved product is what the Alcohol-Free Lavender Witch Hazel Toner by Thayers is. With natural lavender fragrance, it cleanses, soothes, and tones the skin in one easy step. Simple’s Soothing Facial Toner is pH balanced to refresh skin without overdrying it. Packed with skin-friendly nutrients, it also makes use of triple purified water to instantly hydrate the skin. The Xtreme XT Anti-Aging Toner by Xfacio Labs is a toner and an anti-aging product in one. It is pH balanced as well, and is recommended for all skin types. A Korean product, the Aloe BHA Skin Toner by Benton helps prevent skin damage and improve the skin’s barrier. It is free from harmful ingredients and is safe for all skin types. 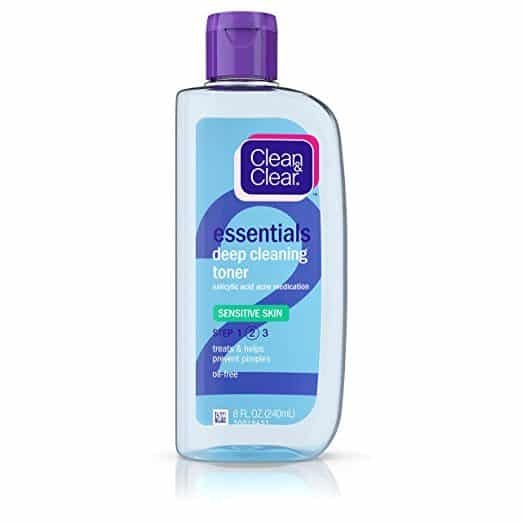 Clean & Clear’s Essentials Deep Cleaning Toner Sensitive Skin comes last in our list. With salicylic acid medicine, it can treat and prevent acne by fighting oil and offering a deep clean. This is the best toner for sensitive skin because it is made with Witch Hazel extracts. Known as the “shrub of life,” this ingredient is rich in tannin that tightens pores for a smoother complexion. This toner contains Aloe Vera extracts, an ingredient that soothes irritated skin. It comes with a subtle lavender scent, and can help in the reduction of acne and control the production of oil. Though unmentioned, this product contains Grapefruit Seed extract as well. Aside from its other benefits, when applied topically, this ingredient can be used to treat minor skin irritations. People with sensitive skin would love this toner because it is free from alcohols. Alcohols tend to strip your face off of its natural oils, which can lead to dryness and thus, worsen the condition. Also, this product offers good value for money. It comes in a very huge bottle, and according to one reviewer, a bottle could last her for more than 4 months. Alcohol-free and pH balanced, this light toner gently cleanses the face without over drying. It also contains 3 skin-friendly vitamins as well as triple purified water to instantly hydrate the skin. Chamomile is its first ingredient, which gently softens and soothes the skin. It also has Witch Hazel that tones and tightens the pores, and Allantoin which helps in softening the skin. Free of any synthetic dyes or perfume, this toner is infused with Panthenol that leaves skin supple, smooth, and soft. It also has glycerin that retains water in the skin’s top most layer. This product helps minimize pores to improve the skin’s texture. It can help restore the pH level of the skin, keep it highly hydrated, and makes skin absorb other skin products better. The risk of skin irritation is also reduced as it only uses triple purified water, their purest water possible. And since it is rich in essential vitamins, overall skin improvement can also be noticed. Lastly, this product also offers basic exfoliation. It is great at unclogging pores, and can withstand even the most humid of weathers. A toner and an anti-aging product, it instantly firms and tones face to make you look younger than you actually are. It also tightens and unclogs pores for a flawless, smoother complexion. Packed with antioxidants, it restores the skin’s youthful appearance by eliminating fine lines and puffiness. It boosts the performance of other skincare products to make them more effective. A pH balanced formulation, this product brings back the life to dull, lifeless skin. Skin energizing and rejuvenating, this toner is recommended to be used by all skin types. Since it contains Matrixyl 3000 (one of the most potent ingredients in anti-aging,) this product is a game changer. It promotes cell regeneration, and repairs worn-out and damaged tissues. Infused with peptides and amino acids, this toner even increases the skin’s overall elasticity. It helps soothe and brighten the skin, and adds a boost of freshness for healthier-looking skin. It also comes in a spray bottle which we really like. It is suitable for all women (whether of color or not,) and promises visible results in one week’s time. Alcohol and fragrance-free, this product is suitable for all skin types. It is also water-less, since it uses Aloe Vera water to provide the skin with a cooling effect and a deep, long lasting hydration. A multitasker, this product aims to solve several skin problems at once. With a mix of 0.5% BHA and Aloe Vera, it tackles bacterial inflammation while providing instant relief at the same time. This toner restores the skin’s pH level and enhances the absorption of other skincare products. It offers good value for money because aside from being water-less, it doesn’t have any fillers. Naturally found in the skin, this product contains Hyaluronic acid. It has a lot of benefits both for the body and skin, including hydrating aged, dry skin and reducing the appearance of wrinkles. Another unique ingredient is snail secretion filtrate. We know this might sound gross, but snail slime actually speeds up the healing process and prevents dark spots from forming. The things we do for beauty, isn’t it? The second step in the brand’s Essentials regimen, this toner has salicylic acid acne medicine to fight and prevent pimples. It is oil-free and works deep down to give you a refreshing clean. Made for sensitive skin, this gentle formula is safe for everyday use. It contains Aloe Vera Leaf extract which has a lot of skin benefits like reducing inflammation and soothing skin irritations. Great at fighting oiliness, this toner leaves skin with a tingling (in a nice way) and a cooling feeling. With just a gentle rub, you are instantly left with smooth, fresh, and a clean face. What’s great about this toner is it’s really cheap, and that you can find it literally everywhere. It also comes in a decent-sized bottle, and a little of this product really goes a long way. If you are curious how acid-based toners can affect your skin, this is a good place to start. The scent, however, can be a bit overpowering. We think it smells more like an aftershave, and the smell tends to linger on the skin even after hours of using it. Dealing with sensitive skin, like any other skin types, can be confusing. You always need to be on the lookout which products work for you, and which ones only worsen your condition. Stay away from products that contain fragrance. Fragrance is a known irritant, so stick with those that have the words “unscented” or “fragrance-free” on the packaging. “Antibacterial” or “deodorant” products should also be avoided. For detergents, “natural” products are something to be considered. Stay away from dye-containing products. Wondered how your shampoo got its color? Dyed products often appear as “D&C” or “FD&C” followed by a color and number. Stick with those that are colorless or undyed, and pick plain-looking products in general. Products with high levels of acidity should also be avoided. Though acids can help prevent breakouts, they can cause outbreaks and flare-ups in sensitive skin. These include kojic acid, ascorbic acid, beta-hydroxy acids, and alpha-hydroxy acids. Common in cleaners and soaps, boric acid (Borax) must be avoided. Alcohols are a no-no. “Fatty alcohols,” like cetearyl, lanolin, stearyl, and cetyl alcohols are an exemption, but still take note how your skin reacts to these ingredients. Limiting one's’ alcohol intake can also help improve the skin’s overall condition. Consuming alcohol only makes the situation worse. Wear gloves as much as possible—especially when getting in contact with harsh chemicals. These include hydroquinone (cosmetics or lotions), sulfates (shampoos,) and acetates. Pick moisturizers that contain calming ingredients such as chamomile, jojoba, and aloe. Choose lighter creams for the summer, while thicker creams are great for the winter. Opt for hypoallergenic products and remember that the fewer the ingredients are, the better. You can also go for baby products because if it is gentle for babies, it can work for you, too. Choosing a toner for sensitive skin can be easy as long as you are well-informed which products to look for and which to look out for. And as long as you consider our advice, you’ll be just fine. We chose the Alcohol-Free Lavender Witch Hazel Toner by Thayers as the best toner for sensitive skin. Free of parabens, it has organic Aloe and Witch Hazel to cleanse, soothe, and tone skin.